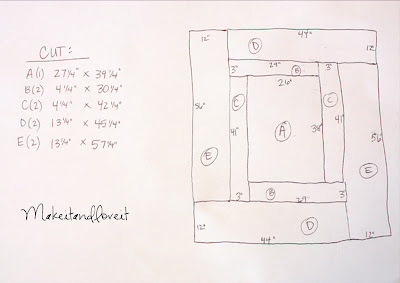 Instead of trying to write the directions for this tablecloth, I decided to take a picture of the diagram that I made and used while putting mine together. As you can see, I wrote the dimensions of each section, right there in each rectangle. Then off to the left, I wrote how many of each I needed to cut and the exact measurement, including a 5/8″ seam allowance on every side. As a point of reference, my table is 3 feet by 4 feet. I wanted the tablecloth to hang off the edge about 10 inches. So the finished product is 56 inches by 68 inches. Also, in case you are altering these directions to fit your table………I wanted there to be about 2 inches of the patterned beige color on the outer ring of the tablecloth, if looking from the top. I didn’t want that brown color to go all the way to the edge. If you want it the same way, make sure to consider that before cutting. 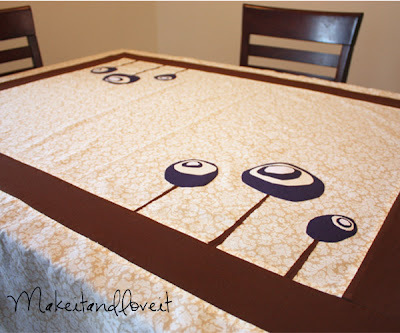 To finish off the center of the tablecloth, I appliqued some flower pieces/stems to the top and stitched them in place. Do whatever looks good to you. Or use the flower idea. Hmmm… or just leave it plain. And of course, I threw some vinyl over the top, to protect all of that hard work from small sticky fingers. (Just remember…if you’d really like to go with the quilted look but don’t like my design, try quilting some squares together, or some strips. Think of what might look nice on your table. )Anyway, what a project. It just turned out to be a fun way to add some texture to our table. I just made some babylegs for my daughter (yay I did it!) thanks to your fabulous instructions. I DO have one question though: she’s a bit chunky on her thighs-if the top of the babylegs is too tight, what do you suggest? 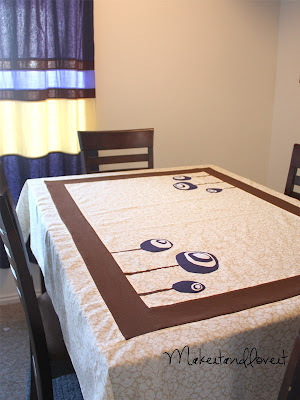 Love the tablecloth, it just adds to the dinning room! What a great idea!! Super cute and fun! Gosh Aubrey…..I’m not too sure. I guess you might want to look for socks that are more stretchy at the top. My little guy is DEFINITELY chunky and the ones I made for him aren’t too tight. So I must have used a stretchier sock. Sorry I don’t have better advice for you. Oh, and glad the directions worked for you. The link is actually to someone else’s pictures. Those weren’t mine. But I thought the lady did a great job showing everyone how to make them. But I’m glad the link was useful!! Cute. I can’t believe you time for all these projects. I love your blog! 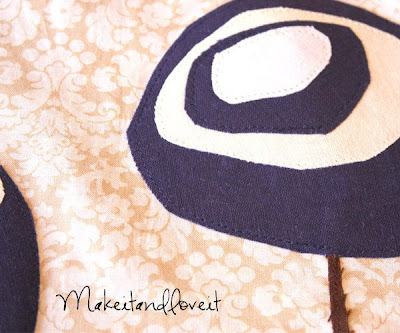 I just got a sewing machine and I love that your projects seem to be so simple, but so cute! I’m excited to try them out. did you use felt or something else to applique the flowers- they are so cute! Mary, glad you found the site. And I hope it’s helpful. And no, I just used some linen type fabric that I had and used some “Steam a Seam” (double sided iron on stuff) and then stitched around it. Diane, I got the vinyl at Wal-Mart. It comes on a big roll, that is cut to order. It comes in different thicknesses. And is like $1.50 or so a yard. Very cheap. I love your website! I’ve really enjoyed the clear directions. I made your repurposed from a scarf owl (although I used an old sweater) last week. It turned out great. I have almost finished your quilt like tablecloth this week. Mine has turned out quite different from yours due to mistakes, but your idea helped me not give up. Thank you! Now I need to finish the hem, but I don’t know how to make my corners as pretty as yours. Could you direct me, please, so I don’t have more mistakes. Thank you.